To get where she is, Holly Coulis had to lop off some heads. 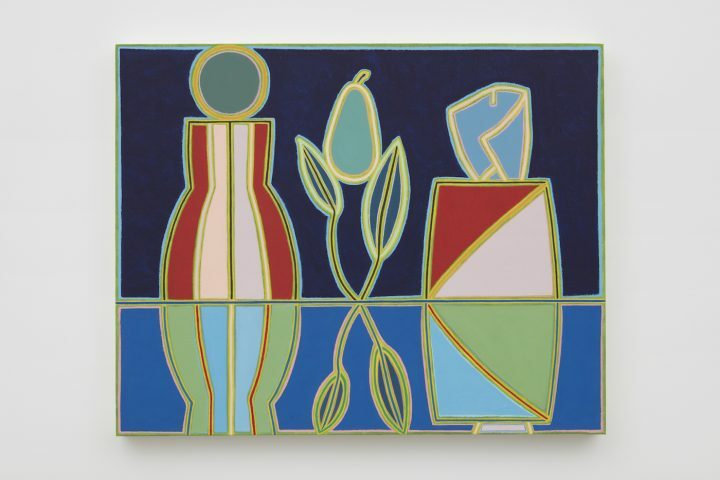 The faces that populated some of her recent semi-abstract paintings, which merge still life with landscape, are absent in her newest works, now lighting up the walls of Klaus von Nichtssagend Gallery. She has removed volumetric renderings with her graphic contour lines, the ellipses at the tops and bottoms of pitchers, cups, and bowls. They suggested three-dimensional space, which was restrictive. These changes — eliminating portraiture from her paintings and compressing the pictorial plane — have allowed her to be more idiosyncratic, playful, convincing, and even funny. The evil guardian protecting splayed Pringles in “Cat and Potato Chips” (2017) stares down the viewer in a tour de force of tabletop comedy. The humor, however, belies a sophisticated execution of color and form. 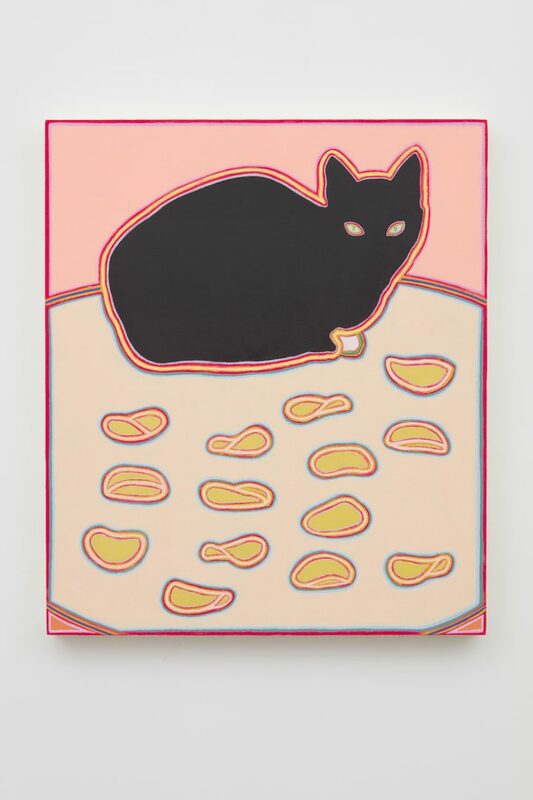 The chips’ shapes are reiterated in the cat’s eyes, rendered as analogous objects, thematically connecting them. The flat black mass of feline form fluctuates between negative and positive space, keeping the cat’s proximity to you uncertain. The shift in scale from chip-to-cat-to-table is a satisfying 1-2-3 increase. As comedians know timing, Coulis knows composition. Cats are not the only devils in the details. Consider line, as line. Since Coulis cut cylindrical volume from her drawing, a means of line-making that she worked toward in her last show has fully arrived. In these radiant paintings, lines result from two painted shapes nearing each other, rather than strokes applied for demarcation. This is the way Barnett Newman made many of his famous “zips” and Frank Stella created parallel stripes of raw canvas — gaps between wider bands of black paint — in his Black Paintings. Coulis revisits these gaps between shapes, accenting them with colored lines to illuminate what in stained glass is dark mortar. 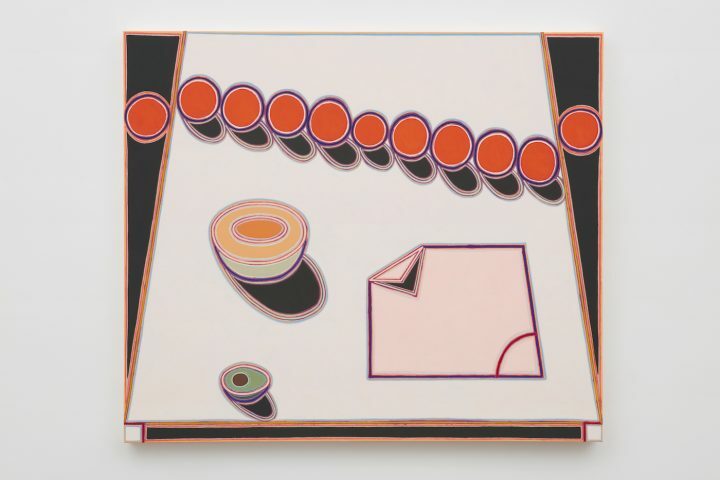 There are other precedents in many of Coulis’ moves: Henri Matisse in commonplace subject; Gary Hume or Donald Sultan in bold tonal contrasts; Wayne Thiebaud in a confected food-to-shadow glow; and so forth. Coulis takes these riffs, first of all, to a place of humor — which is one of the least explored aspects of human experience incorporated into art — and, more subtly, to a quietly complex color palette that’s as pleasing as, say, Fauvist Albert Marquet’s, but is ultimately more elusive. The first color you see, as in the blackish background in “Pear Plant” (2017), suggests purple without actually being purple. Her hues are unnameable and the first one you observe isn’t the true hue; it’s the second or third that emerges after sustained looking. Line and color, to which all painting can be reduced, are, in Coulis’ paintings, delightfully indeterminate. In the course of his work, Richard Diebenkorn drafted “notes to myself on beginning a painting” and attached them to his studio wall. Number 5: “Don’t ‘discover’ a subject — of any kind.” Coulis seems to have reached this point by process of elimination. Where landscapes, portraits, interiors, still life, and abstractions once competed with each other, she has settled on one, the still life, and animated it with another, abstraction. Conceptual strains were pushed off the table, left for the editing floor. Number 10: “Be careful only in a perverse way.” Isn’t this how Coulis makes the shapes in her paintings shimmer, her color elude description, her still lifes laugh? 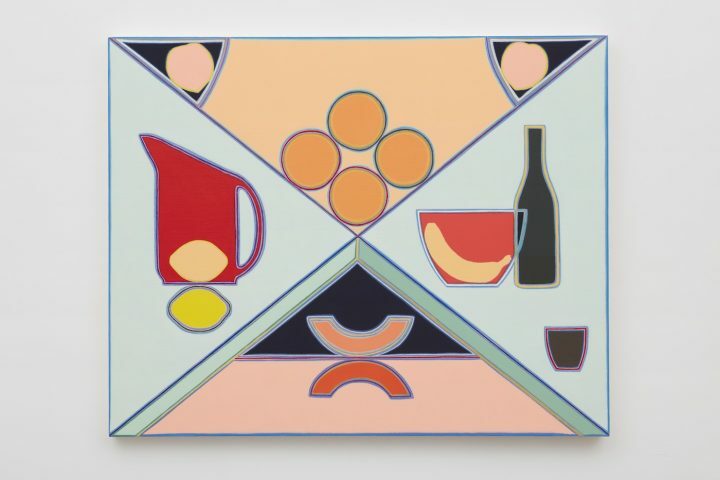 Holly Coulis: Table Studies continues at Klaus von Nichtssagend Gallery (54 Ludlow Street, Lower East Side) through October 22.